Located at the best place to combine a short distance from lonely beach,places,mountains, excursions to traditional villages, samaria gorge, complete tranquility, the region of Lake Kournas offers the best of island of Crete. The two mediaeval Venitian cities of western Crete are located 40 km (Chania) and 30 kms (Rethimno), while the longest beach of the island and the central village of Georgioupolis is 3 kms. The vegetation surrounding the lake and the south-east bank is lined with olive trees. A strip of white sand on the lake provides an area for swimming, cafes and a few taverns. 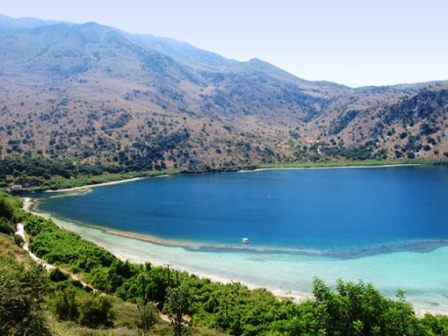 Lake Kournas is also suitable for canoe and bicycles for water. On the road above the lake, are situated cafes and tavernas with views breathtaking. On the road to mountains , some old villages inhabited by local producers of wine,vegetables and traditional cheese from goats, will offer their hospitability. Villa for 4-6 people with private pool, garden, terrace and balcony with view. Kitchen fully equipped with every machine washing. Large lounge, 3 bedrooms Acouchi, 2 double beds and 2 single beds.